Planning to finish or remodel your basement and looking for great ideas to complete the space? Adding a fireplace to your finished basement can serve many purposes. Of course, there’s nothing like the warmth and glow of a fire on a chilly winter’s night. This can be especially true in a basement where you’re more likely to feel a chill as opposed to the other living spaces. Fireplaces also offer ambiance and beautiful focal points to a room, making the room warm and inviting. Now that you think a fireplace is a great idea for your finished basement, how do you choose the right fireplace? 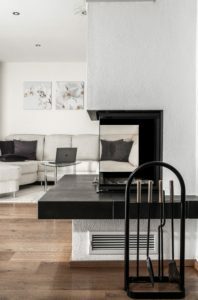 Deciding on one may seem a bit overwhelming, especially with the wide range of fireplaces to choose from, not to mention, not all designs are compatible for basements. But with a few tips and ideas, you’ll soon be shopping for the perfect fireplace for your finished basement. There are three types of fireplaces that can be used in basements, gas, electric, and woodburning. What type you choose may largely rely on the construction of your home. Woodburning fireplaces require a vertical flu for ventilation and if you don’t already have one installed, this can be a lot more involved than the direct vent gas fireplace. Gas requires installing a propane tank and keeping it full in order to use your fireplace, plus general upkeep and maintenance for safety precautions, while electric is mess-free, simple to use, and puts out good heat, though it does not produce a real flame. First, the woodburning fireplace is the most traditional fireplace found in homes. Although usually found throughout the main living spaces, woodburning fireplaces are sometimes seen in basements, too. 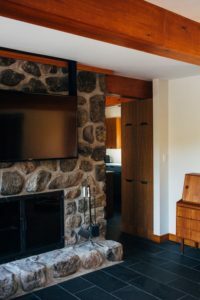 If you prefer woodburning over gas, it may be possible to retrofit your home for one, however, for some homes, a woodburning fireplace in the basement would be an impossibility. What are the positives for adding a woodburning fireplace? There’s just something about a woodburning fireplace that really warms up a space and gives a room an amazing ambiance. Many people love the earthy smell and crackling of burning wood that only a woodburning fireplace can create. You can choose from an array of materials to design your woodburning fireplace. While brick and stone are the most common materials used for a traditional woodburning fireplace, tile and marble are also options. A stone or brick face can give your basement a rustic, or traditional look and feel, while tile and marble offer a more modern appeal. Mantles are often used to complete the look of a woodburning fireplace. Natural wood works well with stone and brick, while detailed, painted mantles compliment marble and tiled fireplaces elegantly. For a flusher look, you may choose to forgo any type of mantle at all. What are the downsides of adding a woodburning fireplace? Before you jump into planning for, and choosing a woodburning fireplace for your finished basement, you may want to consider the downsides of one. Woodburning fireplaces require a lot of maintenance. The flues need to be cleaned on a regular basis to prevent the build-up of soot, debris and creosote, a dangerous flammable material that collects from burning wood. Woodburning fireplaces can also shoot embers out of the pit, making it necessary to use a screen for protection. 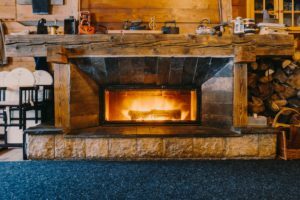 If you aren’t into chopping wood or having to purchase quarts of wood each season, a woodburning fireplace may not be the one for your basement. Ashes can build up quick in the pit which requires regular cleaning to keep your fireplace clean and safe. It’s a dirty job! Electric fireplaces are all the rave these days. They’re sleek, modern, and they are an innovative way to get the heat you want for your basement, all while enjoying the beautiful look and feel of a realistic fire burning. There are different types of electric fireplaces, and it’s all about the quality of the fireplace as to how real the fireplace will mimic a traditional one, right down to the crackling sounds of wood burning. These fireplaces use heating coils along with silent fans to both produce the heat and push it throughout the room to warm it. Above the coils, is a refractor that reflects light by way of LED bulbs, which are responsible for the visual flickering flame. There are also several design types to choose from to fit your design style, including wall mounted and recessed style fireplaces. What are the positives of installing an electric fireplace? The positives are probably obvious in the fact that there is no major upkeep with an electric fireplace. With the flip of a switch, you can instantly have a glowing fire and cozy warm basement in minutes. There are no hassles of gathering wood, kindle, and fussing with trying to get your fire to light. And forget having to sweep chimneys or clean up piles of soot and ashes in the fire box. What are the downsides of adding an electric fireplace? With the electric fireplace, there aren’t a whole of negatives to mention. For those who might be concerned about an outrageous electric bill after a winter of running one, you can put your worries away. While yes, these do run on electricity, these fireplaces are actually pretty efficient and when comparing to the regular upkeep and maintenance of a gas fireplace, the electric will come out the winner. Gas burning fireplaces are nice just for their convenience alone. As long as you have a supply of gas, you can get a nice burning fire in your fireplace as quick as a turn of a key or flip of a switch. Many home builders are installing gas burning fireplaces in homes due to the higher efficiency they provide. New energy codes have been adopted by many states that are either cutting back on the installation of woodburning fireplaces, and those installed must adhere to strict design elements, so gas has become the more popular. What are the positives of adding a gas burning fireplace to your basement? While burning wood gives off heat, it’s not consistent. The fire wanes and waxes as the wood burns down, however, gas gives off a continuous heat to keep your basement space the same warm temperature until it’s turned off. There’s no work involved to get a fire going, just hit the switch and watch the fire instantly start roaring. If you love the idea of a smaller energy bill, you just might see some savings with a gas fireplace. They’re known to reduce energy bills by 25%, which is nothing to sneeze at. Safety is also a big concern for a lot of homeowners, especially those with kids and pets. There are no worries about embers shooting out of the pit, or a burning log rolling out onto the hearth or flooring. And when it’s time to retreat upstairs, you’ll know the fire is safely out on a gas fireplace so long as you turned the gas off correctly. What are the downsides to a gas burning fireplace? Although there are a lot of benefits to adding a gas fireplace insert in your finished basement, there have to be a few downsides. Typically, the biggest cons of gas fireplaces are that you have to purchase the gas to be able to use it. It can be an expensive type of gas and depending on how often you plan to use it, you will have the choice of the size of tank you want to have installed outside your home. You will also have to have it checked or refilled each season so that you aren’t stuck without your heating element just when you want it. One of the main downsides of gas that you’ll hear from homeowners who have experienced both, is the lack of the natural smell of wood burning, along with the snap, crackle, and pop the wood makes. It’s the natural fire experience that some miss most, but if you can enjoy your gas fire for what it is, warm, cozy, and inviting, then a gas fireplace in your finished basement may be the way to go. In conclusion, no matter what you use your basement for, a rec room, study, media room, or any other purpose, the positive benefits of adding a fireplace to your finished basement can add value to your home, and above all, it will make the space more enjoyable – a place you’ll love spending time.